I'm finally home after a long time. Everyone is bugging me about Inuyasha. Kagome's boyfriend is in her house? I want to see him! I want to see him!! But Brother Inu destroyed the bicycle that mom gave her! No problem! I'll make it up to her! What?! You want to use Diamond Spear Blast to create diamonds?! Next on Inuyasha, "The Violent, Two-Timing Boy Who Brings Happiness". I just use Tetsusaiga to replace it! Oh, shut up already! SIT! I'll just carry you, okay? …Inuyasha giving a 'I love you' handsign when Kagome was glaring at him? KAG: I'm taking some time to relax in the modern era! 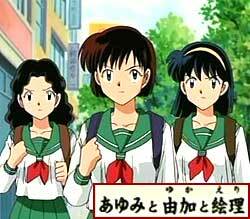 Just when my classmates, Yuka, Eri and Ayumi make a huge fuss about wanting to meet Inuyasha! The girl who was snatched to be a demon's bride, made a brave confession! It's okay! I can forgive all your past! Let us enjoy a good life in the lake! Next on Inuyasha, "Priest Miroku's Past Mistake". Sango... do you have so little faith in me?